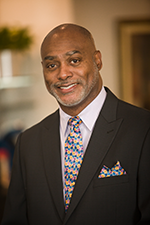 Maurice Grey is the Practice Administrator at CT ENT Sinus Center Hearing & Balance. He has been with the practice since July of 2017. Mr. Grey is responsible for the overall operations of the practice, serving as an information resource and ambassador for both patients and staff. Prior to joining the CT ENT team, Mr. Grey worked as Vice President, Branch Manager at Citibank in Bridgeport, Connecticut. He has held several executive level positions at several national banks and financial institutions. Mr. Grey spent time working as a Territory Sales Representative in Fairfield County. Lastly, he was also a Substitute Teacher where he taught Math and English in the Bridgeport Public School system. Mr. Grey graduated with an MBA in Marketing from Sacred Heart University. Formerly a member of the US Army and Connecticut Army National Guard, Mr. Grey first gained experience in the medical field as a Combat Medic. Mr. Grey lives locally with his wife and their three children. His hobbies include enjoying all sports and being active, teaching martial arts, motorcycling and traveling. We are excited to have him as part of the CT-ENT Team. Discover Quality Ear, Nose and Throat Care – Treating Patients from Fairfield County, CT to Westchester County, NY. After seeing their many ads I convinced Dad to "just have a hearing test." I wish he could use the computer himself to say how sorry he was to have waited so long to get help. This is a wonderful group, and it is easy to see that they truly care about us and enjoy what they do, which is help people hear again. Definitely recommend! Dr. Sheldon Greenberg took care of my deviated septum in my nose, and I am now able to breathe normally at 100% for the first time in 12 years! On top of that, cosmetically my nose, after having to be re-broken during the procedure looks natural, like it looked before it broke in my accident 12 years ago! Highly recommend if you are having breathing issues due to your nose. You will indeed be a changed person. Staff is awesome, also extremely friendly and welcoming. I'm cured! Thanks, Dr. Weiss, Michelle, Lisa, and everyone else. I recovered quickly from surgery, and my allergies are clearing up. Feeling great! If you have any difficulty breathing through your nose or any difficulty with your nose in general, look no further than Dr. Weiss. Dr. Weiss did my surgery on October 5, 2016, which was not as big a deal as I anticipated. Now I can breathe like I've never been able to breathe before. It was the greatest sensation to be able to breathe through my nose. Thank you Dr Weiss for doing an excellent, fantastic, outstanding job. I am so grateful for this practice! For years and years, I suffered terribly from severe sinus infections brought on by every single little cold I'd catch. Dr. Weiss took the conservative approach with the balloon surgery to expand the access to and from the sinuses. This was painless and required no recovery time...It has been life-changing. Dr. Weiss is a caring and skilled doctor to whom I'm grateful for giving me a much better quality of life. The practice, all of the staff members, are caring and fun, and I can't recommend it highly enough! I wish I could give 10 stars! Our experience could not have been better! Thank you guys, for all the time you took to make my little man hear again. Now he can hear me when I tell him I love him.